on Wells Fargo’s secure website. 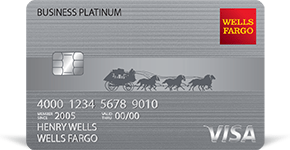 Wells Fargo Business Platinum Credit Card is a credit card that allows small business owners to choose between earning rewards points or cash back. It has no annual fee and has no limit on the amount of rewards points that can be earned. We compiled Wells Fargo Business Platinum Credit Card user reviews from around the web and determined that they generally have positive ratings. We also discussed the rates and fees it offers. People who left a positive review of Wells Fargo Business Platinum said that they were satisfied with the rewards points program which allowed them to choose between receiving a point bonus every billing period or a cash back option. Users were also happy that there is no limit to the rewards points they can earn and that there is no foreign transaction fee. People who left a negative review of Wells Fargo Business Platinum were not happy that their rewards points expire after three years. Some users also think that the rewards scheme is quite underwhelming given that other credit cards offer higher earning rates. Others find the online banking system lacking in certain services. A positive review on Fundera said that the rewards points program is the best feature of Wells Fargo Business Platinum as users are given the option to receive automatic cash back either as credit or check. A user who gave Wells Fargo Business Platinum credit card a negative review complained that he is only able to download two months worth of transactions on the bank’s online system, as compared to other business cards that allowed up to 18 months worth of transactions to be downloaded. Get a $500 cash back bonus when you spend $5,000 in the first three months. This offer is not available if the business already has a Wells Fargo business credit card or had a Wells Fargo business credit card opened or closed in the immediately preceding 12 months. One dollar in net purchases earns 1.5% cash back. Cash backs are credited quarterly (March, June, September, and December) to your Wells Fargo Business credit card account or to an eligible designated business checking or savings account. There is no limit to the cash back users can earn. Receive 1,000 bonus points when your company spend reaches $1,000 in any monthly billing period. Rewards points expire at the end of three years.